I LOVE butternut squash and there's nothing more comforting than a warm bowl of butternut squash bisque at a fancy-shamcy restaurant downtown. For years I have been creating my own lower calorie version of this soul satisfying soup that isn't composed of fifty percent butter and cream. It's always delicious, but never seems hearty enough for a complete dinner. I wanted a way to add more protein and substance to my soup without loading up on high-calorie dairy. My solution: silken tofu. I had never used silken tofu before, probably scared off by the picture of a berry smoothie on the front of the packaging. (I can't think of any reason why someone would make a smoothie out of tofu.) The tofu in this recipe adds protein and body to this soup and hardly effects the flavor. I made this soup even more super healthy with the addition of lots of baby spinach. Lay a large sheet of aluminum foil on a cookie sheet. Spray with olive oil. Add butternut squash and sprinkle with salt, pepper, and pumpkin pie spice. Wrap the squash in the foil so it is tightly sealed. Bake for one hour. After an hour of baking unwrap the foil packet and bake for an additional 45 minutes allowing the squash to brown. This step can be done a day or two in advance. In a large pot add the roasted butternut squash, silken tofu, chipotle sauce, and 2 cups of broth. Using an immersion blender, blend until smooth (this can also be done in a traditional blender in batches). Once smooth add additional chicken broth until you reach your desired consistency. Allow to come to a simmer over a medium flame, stirring occasionally. Add spinach and continue to simmer until spinach is fully wilted. Remove from heat. Season with salt and pepper to taste. Toast walnuts over medium heat in a dry saute pan (smallest one you have). In a small bowl dissolve the sugar in a couple tablespoons of boiling water. Once walnuts a fragrant (but not burnt) add the sugar water to the pan. Stir over medium heat until the water has evaporated and the nuts are dry. Remove from heat. 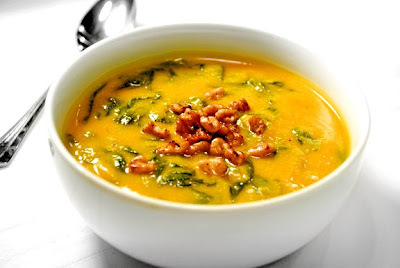 Ladle the soup into a bowl and top with a tablespoon of nuts. I served this soup with maple syrup infused cream on the side for my non-dieting hubby to stir in at his discretion. (To make the maple syrup infused cream simply bring a 1/3 cup of heavy cream and 2 tablespoons of pure maple syrup to a simmer). try a tofu chocolate mousse - for real it is SO good.